Here's another quick card using images from the Friendly Words Wheel that I unmounted in my previous post and SC221. 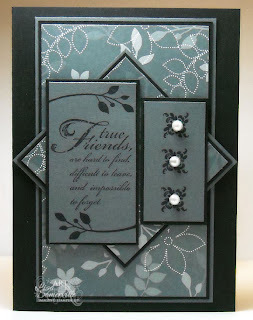 I used my Stamp-a-ma-jig for placement of the sentiment and embellishment from the Friendly Words Wheel - adding the half pearl from the Pretties Kit with a glue dot. The branch leaf (Great Friends) and DSP (Walk in the Park) are both in the Occasions Mini Catalog. I love the whole unmounting thing. I can see SU is going to have to start selling acrylic blocks or extra wood mounts or something - not to mention ramp up production on this wheel!